Winter is coming… and our stores are ready for it. If Game of Thrones characters came to shop at Market Street, and let’s be honest – of course they would, we know exactly where they’d go! When sitting in the Iron Throne—looking killer is key. 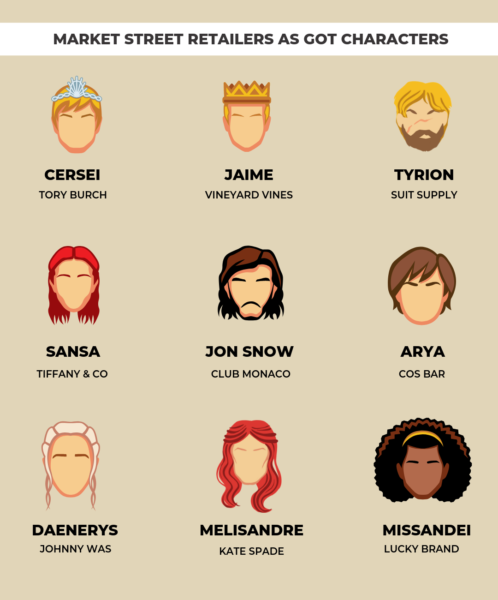 If the Lannisters were a modern family, consider Jaime the Frat Daddy of Westeros! Tyrion thwarts his competition with pure intellect, so he’d definitely look sophisticated in Suit Supply! Jon Snow may know nothing, but if he knows one thing it’s style. We could definitely see him rocking a reversible track jacket while defending Westeros at the Wall. The girl of 1,000 faces needs to be ready for every possible look— good thing Cos Bar has her back! Ruling ain’t always easy, but Dany rocking a Johnny Was dress would make a conquest look like a piece of cake. Although her style might seem mysterious, we know Kate Spade could keep the Red Woman accessorized for centuries. This girl’s always been a good “luck” charm to Daenerys in the translation department.